This online game for real football fans! You can create your online team and win. Pass with the real players a long route in championship. If you are persistent enough, you can become a champion. Football definitely ups the spirit incredibly for everyone. No matter what social class you are, when a ball rolling we all greatly excited. 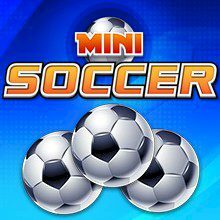 This sport game mad made by miniclip will be no exception for you because the excitement is guaranteed. If you like the most beautiful sport in the world, so today we present a game that will make you remember the football games where you could see who the best is at that time. If you like sports you will definitely like this game. Make your favorite and take and take part in online competitions. Show everyone who you are. Are you skilled enough to win? It is an action game that is worth at least to try. You will love this game from the beginning. Once your enter sports challenge, you can play for hours. So become your way to the medal of champion.